Just after midnight in a small town in Wisconsin, eight women begin walking together down a rural highway. Career women, housewives, mothers, divorcées, and one ex–prom queen, they are close friends who have been meeting every Thursday night for years, sharing food, wine, and their deepest secrets. But on this particular Thursday, Susan, Alice, Chris, Sandy, Gail, Mary, Joanne, and Janice decide to disappear from their own lives. Their spontaneous pilgrimage attracts national attention and inspires other women from all across the country. As the miles fall away and the women forge ahead on their backroads odyssey—leaving small miracles in their wake—each of their histories unfolds, tales of shattered dreams and unexpected renewal, of thwarted love affairs and precious second chances.In luminous, heartwarming prose, Kris Radish deftly interweaves the women’s intimate confessions into the story of their brave, history-making walk. 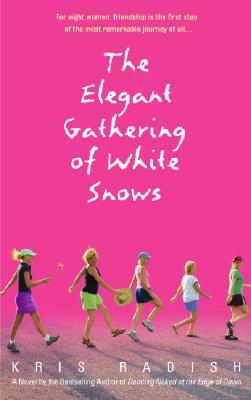 A breathtaking achievement, The Elegant Gathering of White Snows tells an incomparable tale of friendship and love, loss and liberation. Kris Radish is the author of seven books. Her Bantam novels, The Elegant Gathering of White Snows, Dancing Naked at the Edge of Dawn, Annie Freeman’s Fabulous Traveling Funeral, The Sunday List of Dreams, and Searching for Paradise in Parker, PA, have been on bestseller and Book Sense 76 Selection lists. She travels frequently throughout the country speaking about women’s issues, the value of female friendships, and the importance of personal empowerment, as well as the necessity for laughter, a terrific glass of wine, lying quietly in the summer grass, embracing kindness, following the path in your own heart and no one else’s, and having fun at almost all costs. Kris lives in Wisconsin with her partner. She is joined occasionally by a college-age son and daughter—who appear when it’s time to wash clothes or eat a regular meal—and is happily cruising through life on her Yamaha 1200 Classic VStar, her Trek bicycle, a treadmill, a pair of orange-laced walking shoes, and with gallons of calcium and about a hundred notebooks for her novel, short-story, poetry, and journalism ideas. She is also working on her sixth novel, The Shortest Distance Between Two Women, which Bantam will publish in 2009.